They melt in your mouth, not in your hands.... but what about ice cream in 100-degree weather? M&Ms has a new ice cream candy out this summer. 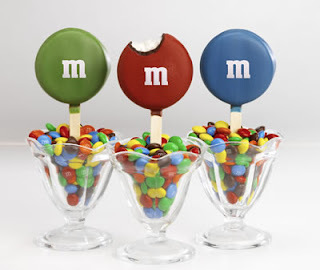 Available as an ice cream bar on a stick and mirroring the look of a classic M&Ms, each bar contains vanilla ice cream covered in a chocolaty coating then dipped in a chocolaty colored shell (red, green or blue) and placed on a stick. M&Ms Ice Cream Treats will be available nationwide in single or multi-packs of five bars at $1.49 and $3.99 respectively. Every treat contains a riddle on the stick from the spokescandies red and yellow; the answers, hidden beneath the ice cream, can only be solved upon finishing all three layers of fun. Beginning in Mid-June through Mid-July ‘Team Ice Cream’ will blitz high traffic areas donned in traditional uniforms consisting of white pants and shirts with colorful bowties. At each stop there will be an Ice Cream Oasis – an interactive old-fashioned ice cream parlor – where Team Ice Cream will distribute coupons and samples and people can cool down with America’s favorite treat. 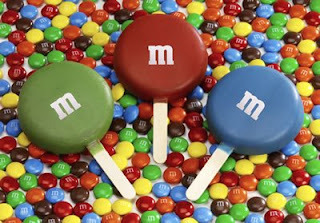 Beginning in May, colorful print and television advertising will further introduce M&M’S® Ice Cream Treats to consumers throughout the country. The advertising creative plays upon the classic M&Ms candies slogan “Melts in your mouth, not in your hand,” by featuring an image of the bright new treat with the tagline “Melts in your mouth and in your hand.” The television campaign will showcase the classic M&Ms characters Red and Yellow having fun in the grocery store’s ice cream aisle.